The first poll on the second debate shows the results much closer than debate #1. According to a Gallup poll of 515 registered voters, Kerry won by 47% to 45%. When asked if they felt more favorable about the candidates after the debate, 38% were more favorable to Kerry and 20% were less favorable. For Bush the figures were 31% and 20%. For a challenger, these are good numbers. Historically, when an incumbent is running for reelection, the undecideds typically don't like the incumbent but are not sure if the new guy on the block is up to the job. His task is to convince them he can do it. In the past, the undecideds have ultimately broken 2 to 1 for the challenger. Although there are several state polls, many are older than the current poll so they are added to the allpolls.csv list but do not change the spreadsheet or the map. 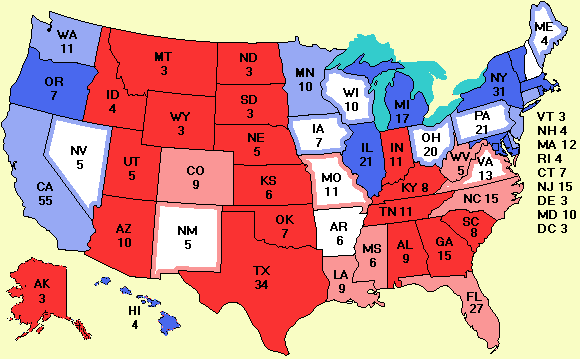 The only change to the map today is in Colorado, which goes from a tie to Bush, 52% to 44%, according to Survey USA. Kerry remains above the magic 270 votes in the electoral college for the moment. Here is the current batch of national polls. Obviously it is an extremely close race once again. With a bit of luck, we may get a Supreme Court double header. The Oct. 5-7 Survey USA poll on the Colorado amendment to allocate its votes in the electoral college in proportion to the popular vote is leading by 45% to 44%. The first fight in the Supreme Court could be over whether the amendment actually passed and if it did pass, the second fight could be over whether it is valid. I got a lot of mail about yesterday's photo of Bush with a bulge under his jacket. Everyone agreed he had something under his jacket. Some people thought it was a wire, but more thought it wasn't. The "not wired" group fell into two categories. The first group thought that if he were being fed answers he would have done much better. The second group thought it might have been a bulletproof vest. Given how polarized the country is, I can understand the Secret Service wanting him to wear one, but I would think it would be uncomfortable and for such an important event I would imagine he would want to be as comfortable as possible. The Battle over the Bulge has become so loud that the Bush campaign felt it had to respond to Salon.com and all the bloggers. The campaign's response according to the New York Times was that Bush was not wearing a bulletproof vest. 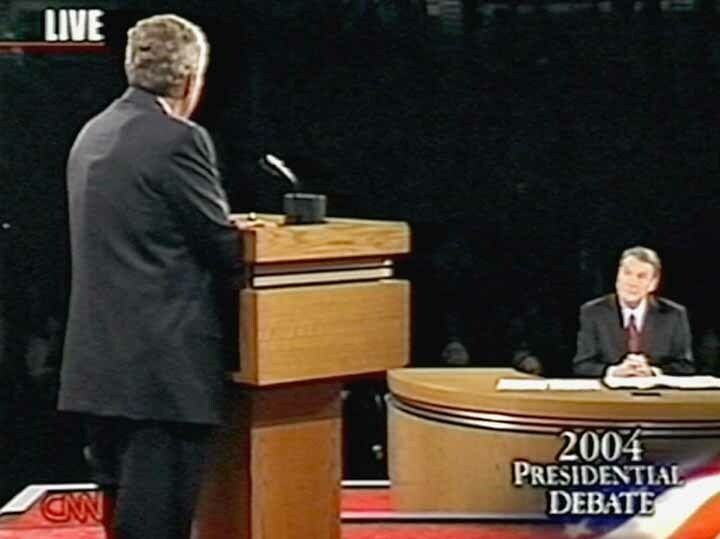 The campaign could not explain the rectangular-shaped bulge, however, a photo of which was independently extracted from the debate video by Salon.com and this site. It appears at 24 minutes, 26 seconds after Jim Lehrer says "Good Evening." If it was not a bulletproof vest, the radio theory seems to be back in the picture. Here is the photo. All we know for sure is that it is not a bulletproof vest. The makers of Jib Jab have struck again with Good to be in D.C. If you haven't seen both of them, take a look. They are both nonpartisan and very funny.